The very first SCA function I attended was a demo in Ravenswood, West Virginia hosted by the Barony of Blackstone Mountain; but my first “event” was the Tournament of the White Hart hosted by the Shire of Port Oasis in Huntington, WV; which I later had the pleasure of autocratting for its 20th anniversary. Sasson is a capriciously aligned and politically engaged man of self-made gentry who provides consultation on affairs of state. He established his estate by working as a courier for conflicting patronages during the 16th century. 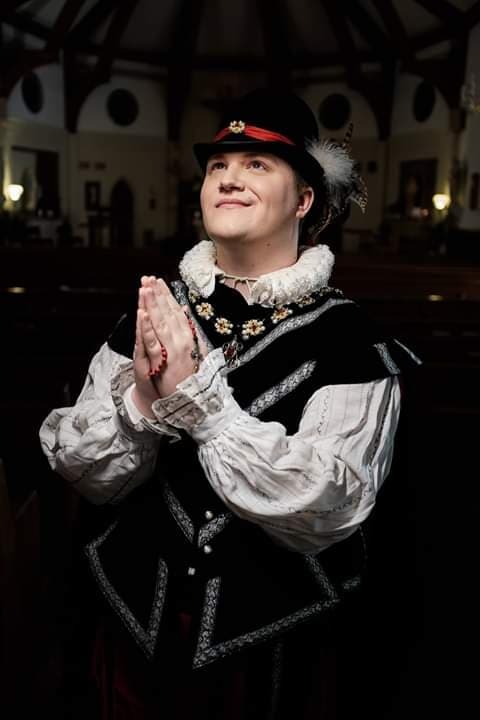 I find a great deal of inspiration from historical figures such as Niccolo Di Bernardo dei Machiavelli, Sir Francis Walsingham, and Christopher Marlowe. I am fascinated with the history of espionage and duplicitous statecraft and wanted to create a persona that could have served such a clandestine individual. I am not currently affiliated with any households, although I am friends with many who are, and if I were more involved with martial activities I imagine I would be. However, I am a member of the Blue Feather Clan, and am apprenticed to Mistress Anne Grey. Tell us a little bit about your life outside the SCA. 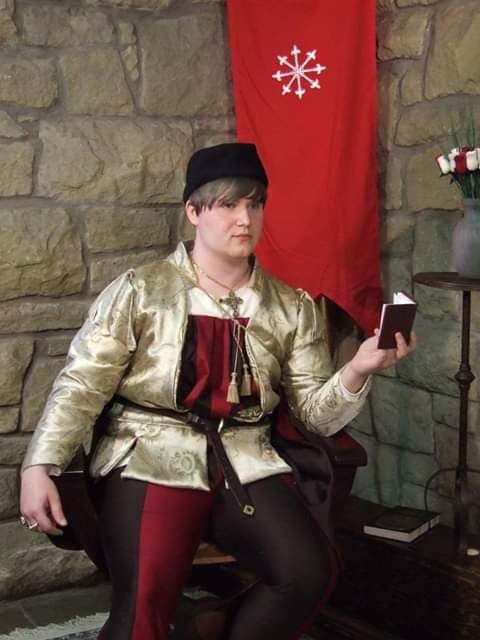 A. I recently married Lord Allene Naughty (Robert Harvell) and moved to the Barony of St Swithin’s Bog (previously from the Shire of Port Oasis). I am the proud parent of two beautiful shelter kitties; Armand a tuxedo boy, and Jambo a golden girl. I am the author of Autumn Rose, a debut fantasy graphic novel series that is published on Tokyo pop’s POP comics app. I have been travelling across the U.S. with my husband since August and I’m looking forward to studio painting when I return home in December. 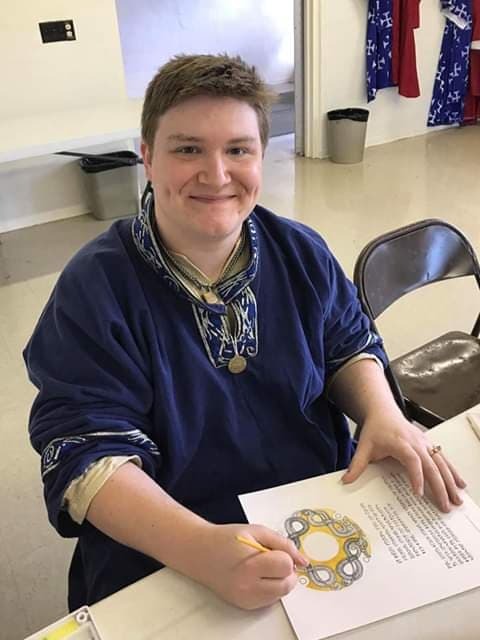 I participate in A&S competition s and displays, autocrat events, teach classes, create items for largesse, and in the past few years I have become a scribe for our kingdom. I also enjoy archery and thrown weapons. Tell us a little bit about your SCA experience. I have served the Shire of Port Oasis as youth minister, herald, chronicler, and A&S officer. I’ve represented the Barony of Blackstone Mountain as A&S and Thrown Weapons champion. I’ve served as staff for Sicilians Revenge, Under the Greenwode, and autocratted the Tournament of the White Hart, and I was once selected as the Artisan of the White Hart. I’ve entered twelve A&S projects and taught over twelve hours of classes. I am a companion of the sable anvil, the sycamore, and the keystone. My first few years in the SCA didn’t have much direction until I met Master Fiachras Bonesetter, who I then aspired to study under. Back then my only goals were to research interesting projects that he would be proud of and to dress as opulently as his Mistress, Anne Greye. I still strive to work on interesting projects and dress for success; but I would definitely love to teach more especially in the realm of scribal arts. I’m also looking into ways to innovate the way I teach and go outside the “class at an event” setting. My big goal now is to make enough quality and quality of scrolls that I become a household name; not for the sake of word fame, but to gauge the impact I hope my service will have. That is a secret, you’ll have to wait and see. My advice to my past self and to any newcomer is: Don’t be afraid to ask questions or take initiative. I’m a very introverted person so doing very public things like teaching and autocratting was and is still sometimes a scary thing; but pushing my boundaries has really helped me grow as a person. For me, getting the courage to jump in and volunteer has paid dividends and I’m much happier for it. I still need to strive for that courage so it’s advice I’m still following. “Anything worth doing, is worth doing badly at first” I love learning and have great patience for failure, so I think I’d rather wake up and find all the tools and supplies I need to learn something new. I hope to be inducted into the Fleur and Laurel one day; but I have a lot of reverence for the exceptional folks that receive awards for courtesy, character, and service to crown, i.e. the Jewel or Sigil.